This title was first published in 2001: Governments world-wide have developed policies to encourage innovation, entrepreneurship, and small firm growth, and to increase access to small firm finance. However, the effectiveness of small firms and entrepreneurs as innovators depends on their incentives and the effective governance of relations between entrepreneurs, investors, and employees. 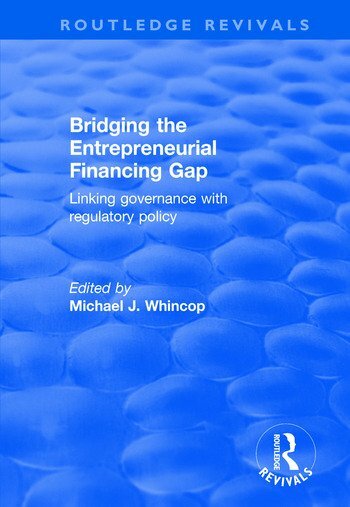 This book links these regulatory policies to the ethical and governance practices of small firms, in order to explain the impact and success these policies might be expected to enjoy. The book examines the empirical and theoretical nature of governance practices in small firms, as well as a range of regulatory policy areas, including intellectual property, insolvency law, taxation, securities regulation, and directors’ duties in Australia, Europe, and North America. Contents: The gap into governance, Michael J. Whincop; The demography of investor heaven: international research on the attitudes, behaviour and characteristics of business angels, Kevin Hindle and Susan Rushworth; Angel investors and the angel capital electronic network, Zoltan J. Acs and Stephen Prowse; What economists have taught us about venture capital contracting, Michael Klausner and Kate Litvak; Entrepreneurial governance, Michael J. Whincop; SMEs - small in business and small in ethics?, Charles Sampford; Rethinking receivership, John H. Armour and Sandra Frisby; The role of the enterprise market in SME finance in Australia, Therese Wilson; The changing face of Australian intellectual property law: an economic and comparative perspective, Megan Richardson; Investing in the future - taxation issues, Ann O’Connell; Some international comparisons in the provision of tax incentives to SMEs, Philip Burgess; Index. Michael Whincop is an alumnus of the University of Queensland, where he received University Medals in Commerce and Law. He has published over forty articles and chapters in books in conflicts of law, corporate law and economic analysis of law in leading journals in Australia, Canada, the United Kingdom and the United States and has presented, by invitation, workshop and conference papers at Cambridge, Yale, Penn, Toronto, New York and George Mason Universities. He has recently published two books with Ashgate on the economics and legal philosophy of conflicts of law and on economics and the jurisprudence of English corporate law and is at work on a new book on law and the small firm.